Mehadrin Kney-bamboo mats are hand woven and composed of robust strips of bamboo joined together by strings that derived from natural plants. These bamboo strips are water resistant and are made to endure outdoor weather conditions. 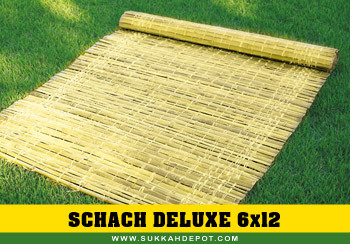 The bamboo mat presents a beautiful finish to your sukkah for years to come. The Bamboo deluxe v provides greater resilience and flexibility is also available. Note: All Schach is certified by the Badatz Eida Haredit, as well as many other leading Hechsherim. The Bamboo deluxe mats are packaged in a sturdy plastic case meant for transportation and storage.